Why it matters: AMD addresses low-latency issues associated with Vsync with latest Radeon software. "Enhanced Sync" turns off Vsync whenever frame rate drops below your monitor's refresh rate eliminating stutter and input lag. In gaming, there is a lot of talk about frame rates. Typically, higher fps is better. However, once the frame rate exceeds the monitor’s refresh rate, the chances of the game producing video artifacts increases — usually in the form of screen tearing. Likewise, when fps drop below the refresh rate, the game experiences input lag and stutter. To combat this problem vertical syncing more commonly known as Vsync was created. Without getting into the technical details, Vsync essentially synchronizes a game’s frame rate to the monitors refresh rate. This creates a much smoother experience graphically. It does this by pausing the GPU if it finishes drawing a frame when the monitor is in the middle of refreshing. The downside to Vsync is increased latency and stutter when the fps drop. And that's why more advanced technologies that rely on better monitors also exist, namely G-Sync (for Nvidia GPUs) and FreeSync, though this require actual hardware support. 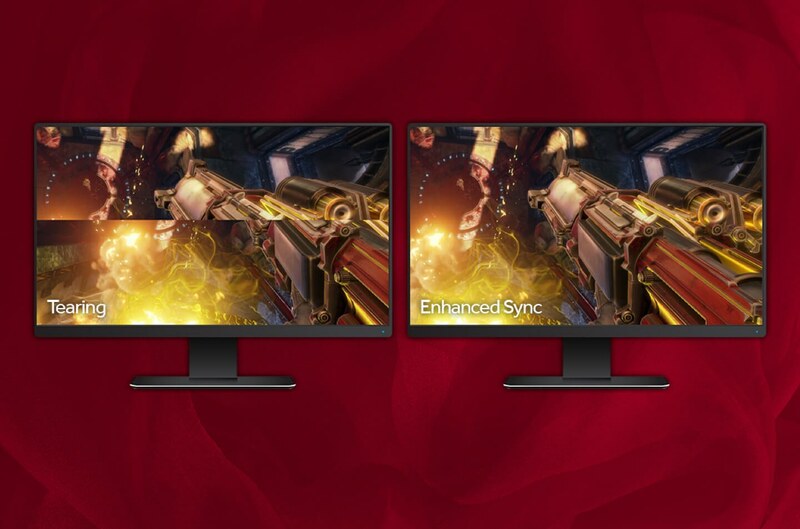 Most recently AMD has been touting an additional software solution that they believe can enhance what Vsync already provides. Enhanced Sync enabled games can run with an uncapped frame rate and still experience the same tear-free gaming that Vsync offers. Enhanced Sync does not replace Vsync, but rather works with it. Go to your Radeon settings and under the gaming tab, select Global Settings. Look for the option that says “Wait for Vertical Refresh,” and click it. In the sub-menu, click Enhanced Sync. You can also set it for games individually by selecting them instead of Global Settings. Enhanced Sync is available with the latest Radeon Software Adrenalin Edition drivers (version 17.7.2 and above), which you can download here. The technology supports games that use DirectX 9, 10, 11, 12, and Vulkan. There is no support for OpenGL.